For two decades we’ve worked together to transform the food system and raise chefs’ voices across the country. As we enter the final days of our 20th year, we want to share the 20 things we are most thankful for in 2013. Members of the Knoxville Local gather around a whole hog butchering demonstration at the Plaid Apron Café. 2. Southern hospitality. Can you say OYSTER ROAST? 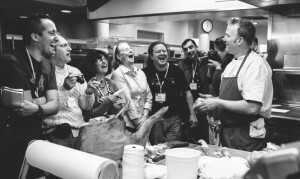 We were blown away by the awesome welcome we got from the chef and food community when the Sustainable Food Summit landed in Charleston, SC this fall. And to our host committee, thank you, you were there at every turn. 3. Pimento cheese. Because we can’t get enough. Who really can? 4. Rhymes with duck. Who doesn’t appreciate a well-placed cuss, especially the ones dropped by our Board Chair, Chef Michael Leviton?Michael is the walking, chopping, swearing embodiment of our mission. 5. Our badass Board. They are a force to be reckoned with. Even the ones who might not use Michael’s colorful language (and there aren’t too many that don’t), the chefs and experts on our Board have the smarts, the talent and the passion to lead the revolution to transform our food system. Meet our Board of Overseers. 6. Our philanthropic and corporate partners. What can we say? You can’t drive a car without gas in the tank… an effusive thanks to The David and Lucile Packard Foundation, Bristol Bay Regional Seafood Development Association, Pew Charitable Trusts, Niman Ranch, Organic Valley, Anolon, Compass Group, Monterey Bay Aquarium, and all of our sponsors! 7. Shutting down the bad guys in AK. Chefs heeded our call to action to put Bristol Bay sockeye salmon on their menus this summer, and kept the threat of Pebble Mine in the news. One of the major investors also pulled out of Pebble Mine. Woo hoo! The fight’s not over but we’re giving them a wallop. 9. Chefs who want to tell the White House the way it is. More than 500 chefs responded decisively to our call to action to let our friend at the White House, Sam Kass, know how we feel – overuse of antibiotics in meat production is killing us. Thank you also to Pew Charitable Trusts for putting your resources behind this issue. 14. The Chefs Collaborative Cookbook. Because you ain’t got street cred unless you’ve got a cookbook. With 115 recipes from member chefs, it makes an excellent holiday gift… hint hint. 15. Boulder, Colorado. During the 2013 Summit in Charleston, Boulderites Sara Brito, Bradford Heap, Kelly Whitaker and Eric and Jill Skokan did their homework for our 2014 Summit, which will be in Boulder next fall. Thanks in advance to chef Hugo Matheson and Sylvia Tawse for co-chairing the Boulder host committee and to the Boulder community. We can’t wait! 16. Sustainability stars. The 2013 Sustainability Awards went to chef Rick Bayless, National Sustainer; chef Anne Quatrano, Sustainer Southeast; Will Harris, Southeast Foodshed Champion; and Glenn Roberts, Pathfinder. We’re in awe of what they do. 17. Whole pastramied lamb. Because who does that? Craig Deihl of Cypress in Charleston, SC. That’s who. 18. Your kooky creativity. While we have our wonky standouts like Portland Oregon’s “It ain’t all Crappie” Trash Fish Supper and the New Hampshire Local’s nearly indescribable musical revue, featuring original songs written and sung by chefs and a board member dressed like a gypsy, there isn’t enough space to share all of the menus, field trips, gatherings, and stories from our members. Chefs are a creative crew, and we can’t wait to see what you do in 2014. 19. Our core! We simply cannot thank our members enough! Chefs Collaborative is a membership organization and your involvement is vital if we want to change the food system together. Thank you (and it is not too late to become a member in 2013). 20. YOU. It all comes down to you. You change the ingredients, the menus, the conversation that will fix our broken system. Thank you for being a part of our community. 21. Your gift. Make us the happiest non-profit in the world this holiday with a tax-deductible gift of any size. All the best for the holidays and a happy New Year! And cheers to 2014 – let’s transform the food system together.